To get this discount, all you need to do is enter the code: GT1 at checkout. This is running for a limited time only, so get those orders in quick! 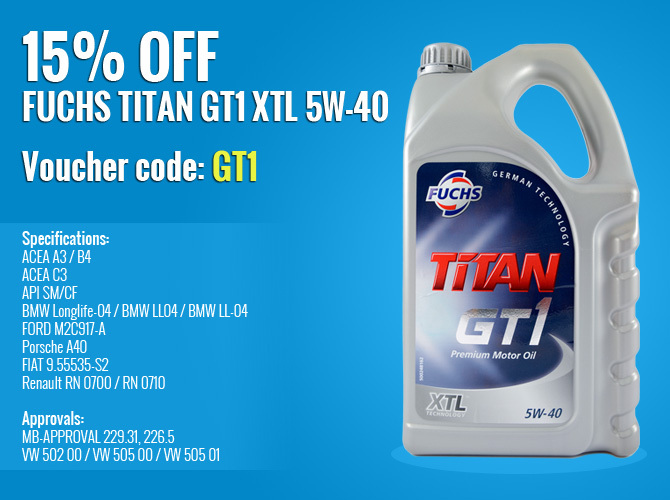 Fuchs Titan GT1 XTL 5w-40 engine oil is a premium motor oil for modern passenger cars and light commercial vehicles with or without extended service intervals. Designed to meet the requirements of up to date engines with pump unit injector and common rail injection. Specially developed for vehicles with exhaust after treatment and turbocharger. Optimum cold starting, lower oil consumption and minimised exhaust emissions and even fulfils the special requirements of many car manufacturers including VW engines with pump unit injectors. Really popular in BMWs, a huge amount of Renaults and VWs, you can see why this is such a highly reviewed oil. One last time, that discount code is GT1, and you can find this product HERE. If there’s any other Fuchs products that youre interested in, you can find the full range HERE. You’ll find quality gear oils, ATFs and differential oils, brake fluids and even their popular cleaning products. It’s also well worth having a look through our look up guide – all you need to do is select what you’re after, enter your vehicle details and hey presto. You can find it HERE. Give us a shout if there’s any clarification that you need, we’re on the phones and emails Monday to Friday 8:30 – 5:30 on 01209 202 949 and sales@opieoils.co.uk. You can also drop us a message on here.